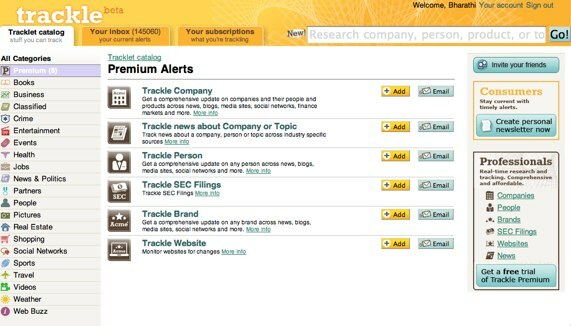 Trackle, the personalized web and realtime feed tracker, is going pro with the launch of premium tracking services aimed at marketing and PR professionals looking to track mentions of clients across the web. Trackle .com’s web service lets users create personalized RSS feeds for data such as the latest crime in a user’s neighborhood, fluctuating airline ticket prices, updated job listings, sports scores and more. On Trackle, marketing, PR and sales professionals can set up realtime tracking alerts for key words to track press coverage and mentions across Tweets, blogs, Facebook, LinkedIn and the web. The initial service will allow users to enable “Trackles” for a select number of keyword categories, including company, person, brand, SEC filings; website changes and LinkedIn updates. Trackle will email and SMS alerts for mentions and even provide users with graphs and charts detailing results. The service is available for $9.99 per month. Trackle, which launched a year ago, recently became more social by allowing you search and follow other users’ Trackles by keyword. The search platform also lets users filter the sources by credibility, social network and more. Trackle will also show users who have similar interests, so you can. The startup is also trying its hand at setting up Trackle button on sites to provide instant tracking options directly to consumers to allow users “Trackle” an item or feed from anywhere on the web. Trackle now has 100,000 users and is generating 2 million alerts of information each day. It’s sort of like Google Alerts on steroids. But the premium service will face competition from the plethora of social media and web tracking services in the space, including Viralheat, Socialseek and others. As we’ve said in the past, the major obstacle Trackle will face is gaining more users and becoming viral. But it seems that the site is looking to engage PR and marketing professionals instead of consumers and with its reasonable pricing, it could find a loyal following in this sector.